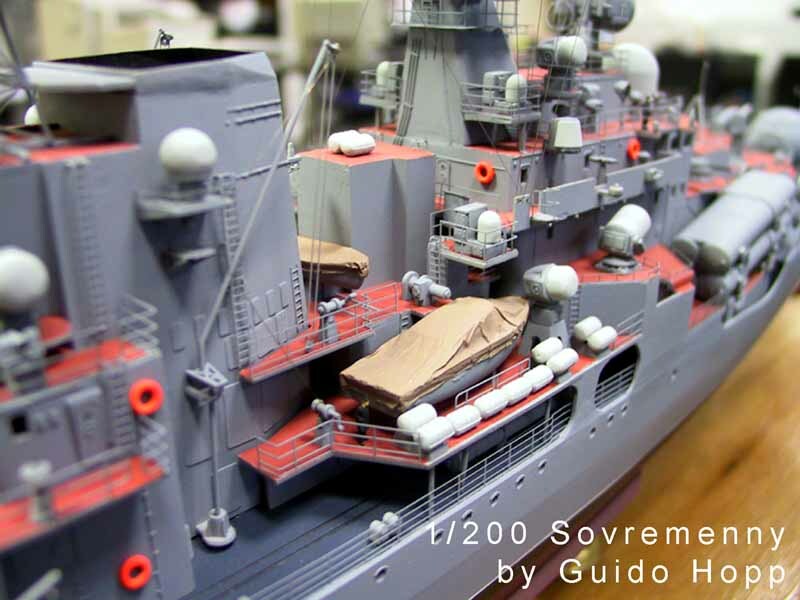 Having finished the hull and superstructure I turned to detailing the kit. 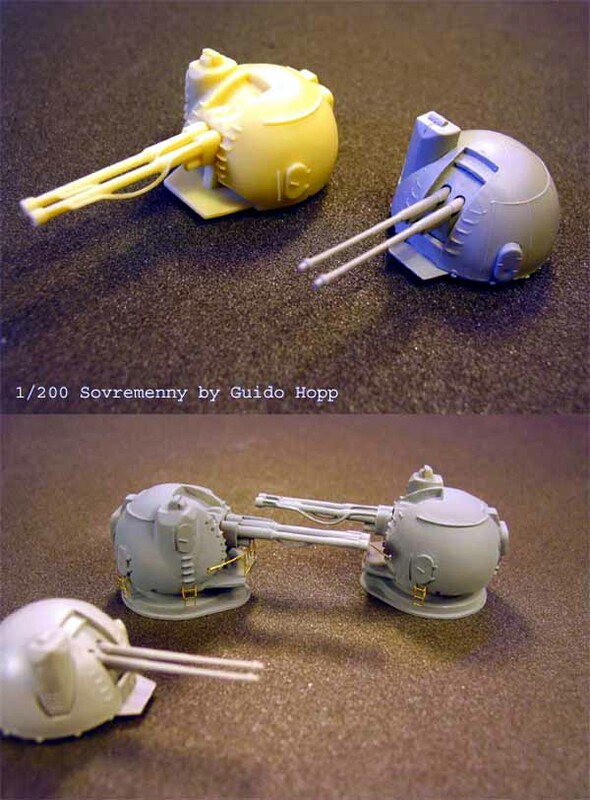 The thing I really liked about Trumpeter’s 1/200 Sovremenny from the very beginning was, that there is almost no detail moulded onto the decks. Each tiny detail is a separate part, saving you extensive deck masking. The flip side of this coin is, that you have to clean up all of those parts, which can be very monotonous as well. The deck equipment provided in the kit is pretty much complete. 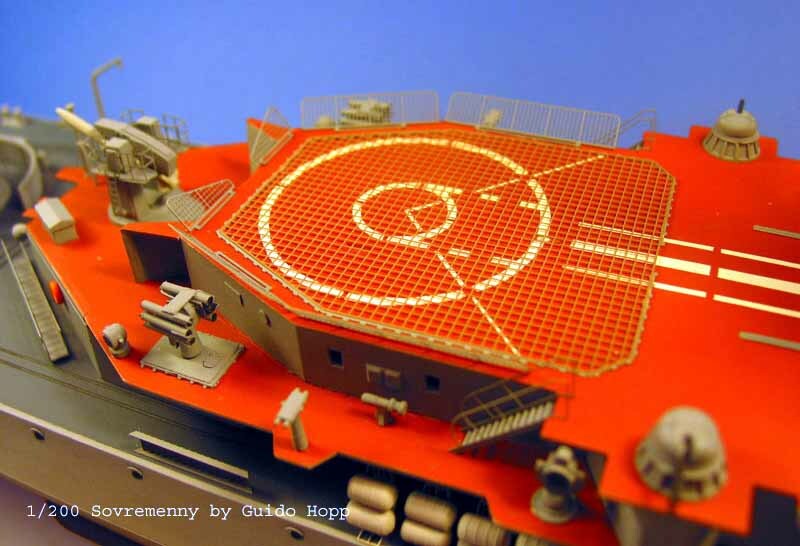 The quarter deck is nicely depicted by the kit, only the decoy launcher’s chutes are missing. 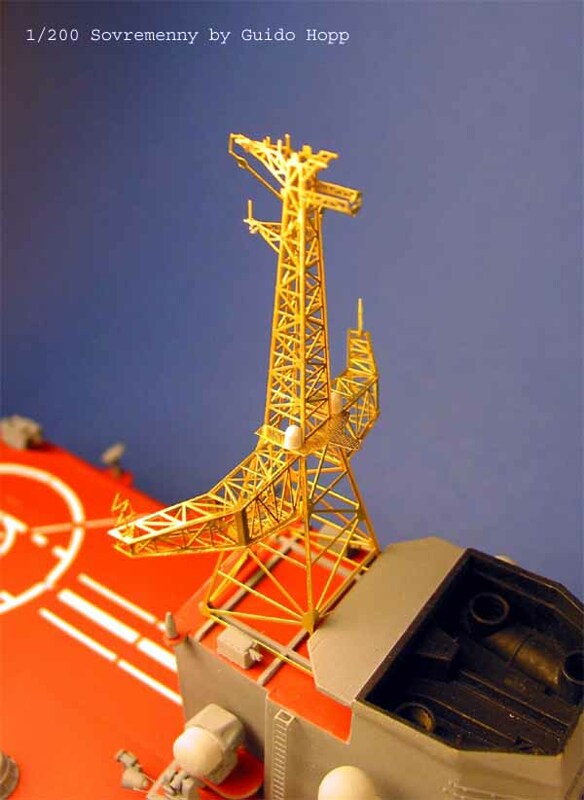 I made them from 1/350 PE plane catapult scratch. For your own good, be extra careful when removing the stanchions for the cable reels from the molding tree: They brake very easily and are hard to replace. In my case I used GMM 1/350 PE cable reel stanchions as replacement. For extra detail, put a few turns of thread –black for steel cables and beige for ropes- around the reels. For some part the life raft canister racks coming in the kit are insufficient to represent the real thing. The kit’s racks block the walkway on deck almost completely. 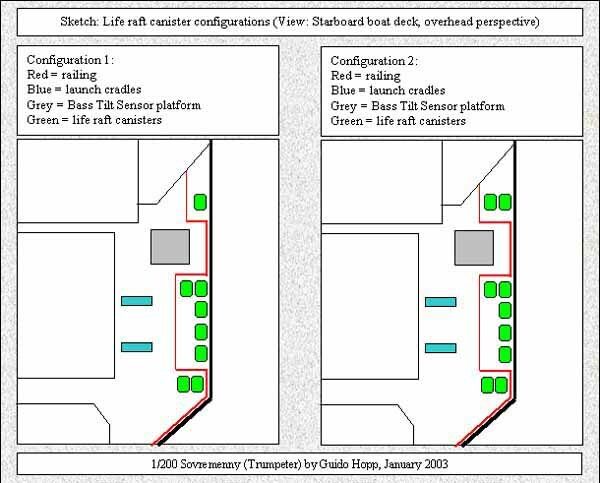 As well, the canisters on the main deck, below the helo –deck, should be almost on top of each other. To create this effect I formed the racks from 1/350 PE 2-bar railing. 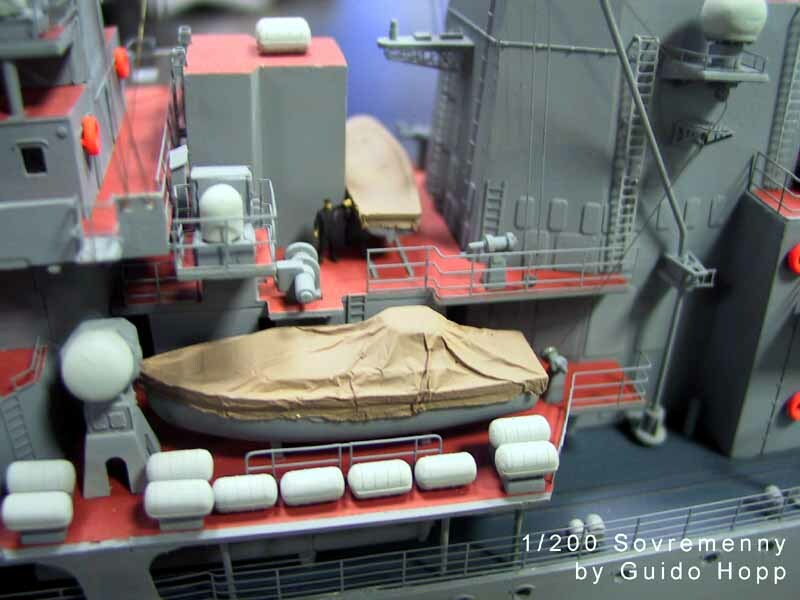 An alternative would be to cover the rack’s bottoms with styrene sheet and glue their backsides onto the deck. The original parts may be used on the boats decks as they come. I drilled out the torpedo tubes and added some PE scratch. 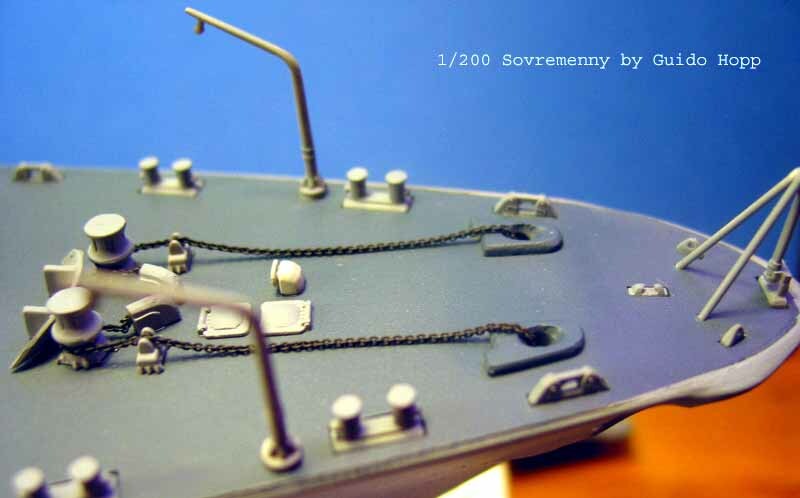 1/350 GMM PE fire hoses represent the closing mechanism and 1/350 GMM PE deck hatches represent the pressure valves. 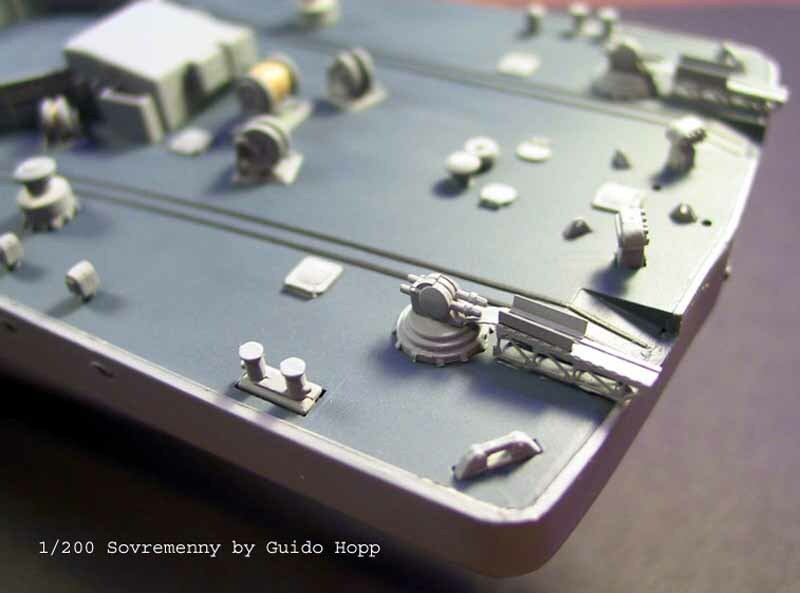 According to the photos, provided by Mr. Doug Hallet, the torpedo tubes on the Sovremenny face forward! 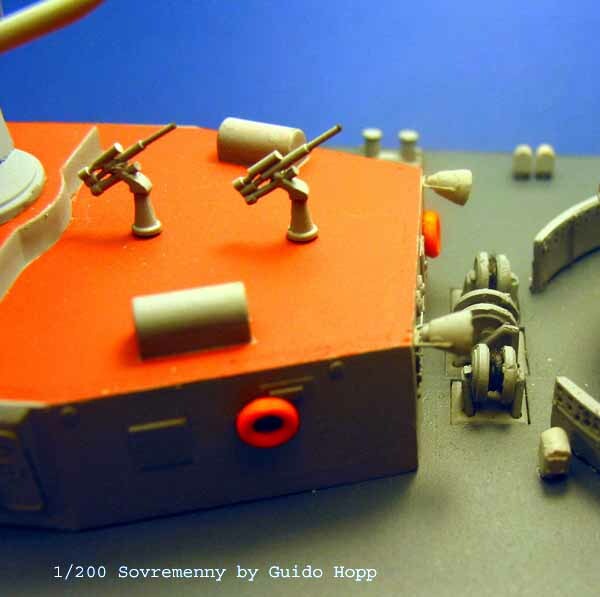 The SS-N-22 launchers are most significant distinctive marks on the Sovremenny: They draw lot of attention to them. Unfortunately the kit’s launchers have flaws beyond repair or make-up and are too complex to be rebuilt for a modeler of my skill: There should be a depression running along the upper two launching tubes and there should be deep indentations at the side of the braces of the launchers. These indentations are represented by protrusions on the kit, while the depression is missing completely. I am left with hope for some aftermarket supplier to cast them in resin. I used the original kit’s parts only adding a box made from scratch below the launchers right behind their mountings. This box houses – I think – the ignition system. (I welcome other educated guesses or even better, solid information on that). On Sovremenny 956A’s there is a cable leading from this box to the launching canisters. On 956E’s – like mine - this cable has been covered by an extension of the aft bracket and is not visible any more. On the focsle turret ring I drilled out the tiny holes and again added stanchions to the inside to the ring. The anchor runs on the focsle are missing completely. 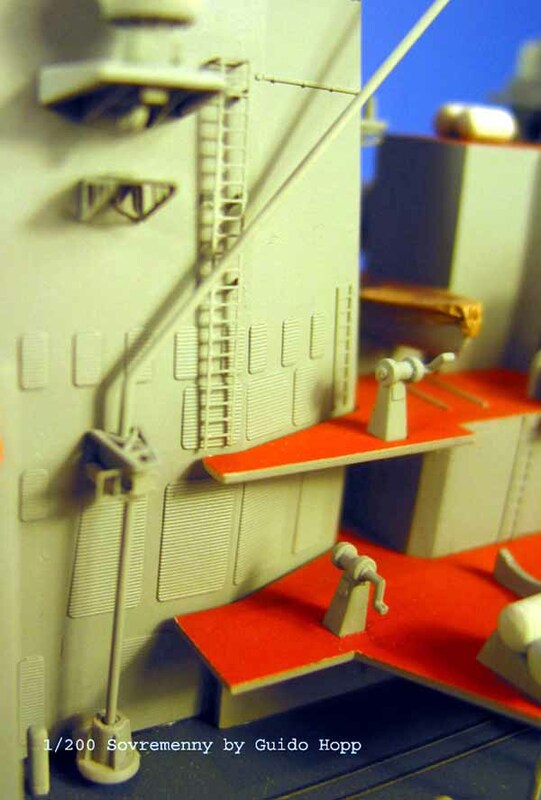 I build mine from styrene scratch. 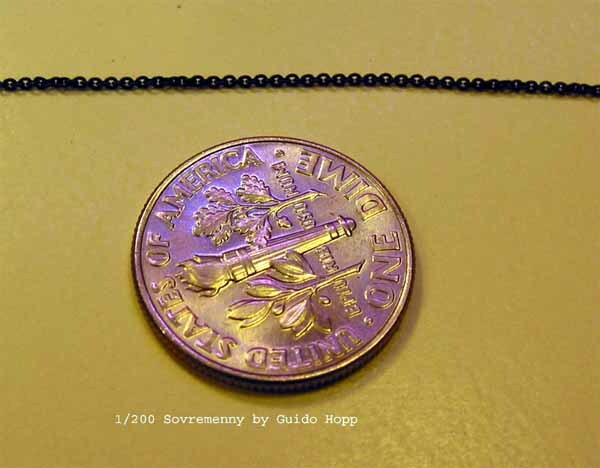 The anchor chain is a 22 links/cm (56links/in.) treated with “Brünierungsmittel” (supposedly same as US brand “Blacken-It”) both provided by the German Company Krick. 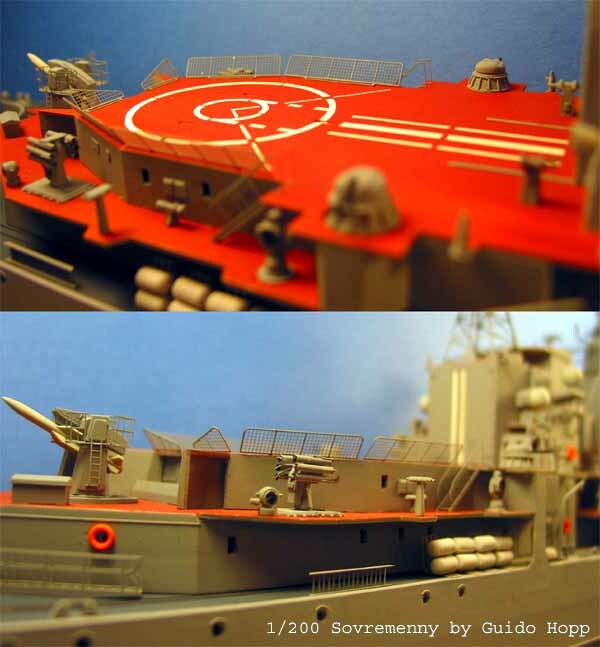 All other details on the main decks – except the AK-130 turrets- were installed as given “by the book”. Note, that I install flag staffs and davits always late in the construction process, because I tend to get caught in these and break them off, while working on the superstructure. Usually I install them before I apply the main deck’s railing. With some exceptions all upper decks fittings were installed as provided by the kit. I added some styrene scratch to the top and a cable to the bottom of the Kite Screetch sensor. 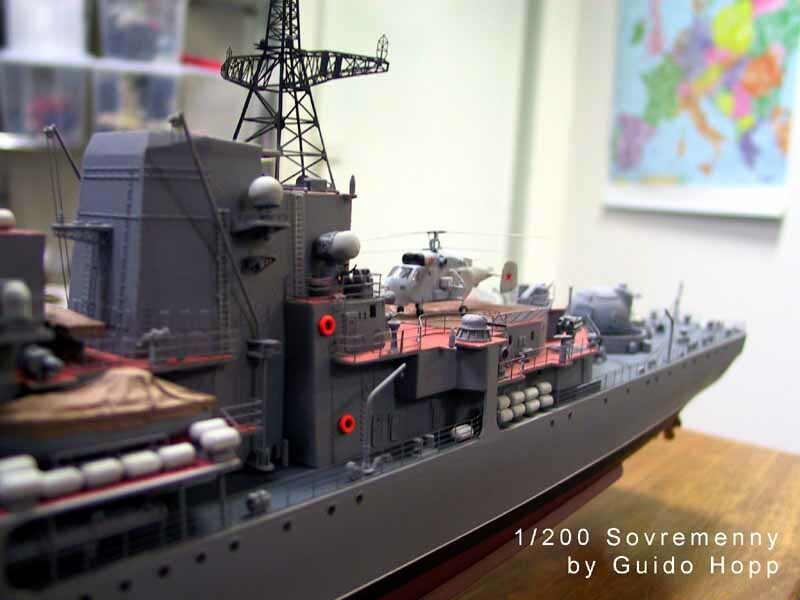 All other forward superstructure details were installed as provided by the kit. In this picture the nice effect of having cut out the windows on the bridge becomes quite evident. As mentioned in part one of this review, WEM’s PE set features very nice vertical ladders with support struts for extra detail depth. 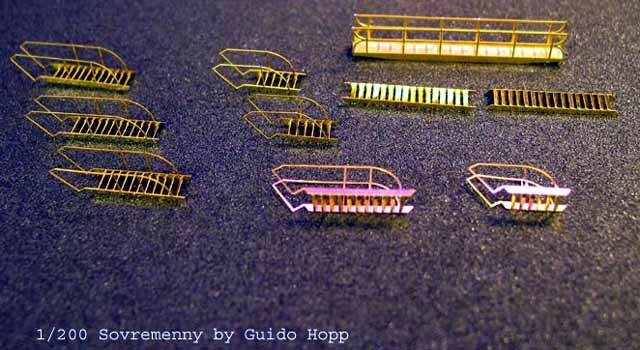 Even nicer are the inclined ladders and walkways of this set: Each step is supposed to be fold into horizontal positions, creating a perfect see-through effect and realistic appearance. What may sound difficult is indeed easier to achieve, than one might think: fold up the handrails, hold the ladder/walkway by it’s upper two steps using pliers, or high tension cross-pliers. Now carefully flip the steps into the proper position with the tip of your X-Acto or scalpel blade. The positions are indicated by relief-etched lines on the inside of the step runs on either side on the handrails. Finally fold up the upper two steps. Each ladder was finished in about two minutes. WEM chose very stabile brass for their ladders, the chances of messing them up is relatively small. I sincerely hope we will see such features in future 1/350 PE sets. I think it is feasible to etch those in this scale, too! 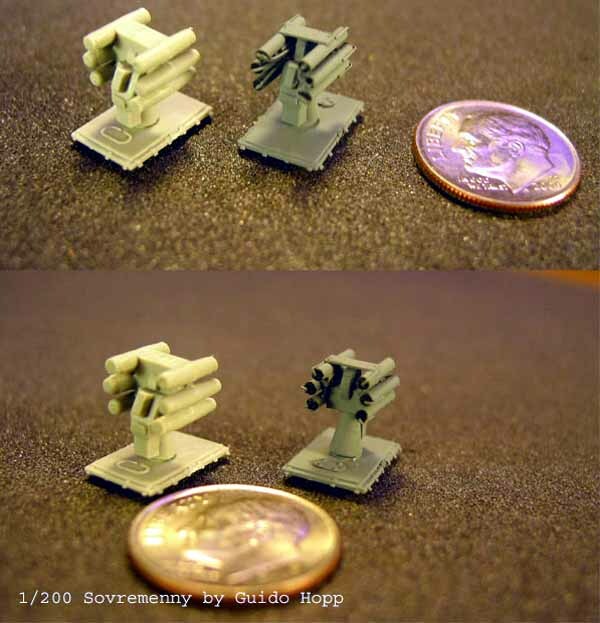 I rebuilt the saluting guns form styrene rod, as the kits parts were completely unusable, due to previously mentioned bad mold alignment. I added “U” shaped PE braces for all six speakers. Again, bad mold alignment made me rebuild RBU-1000. While being at it, I added a 1/350 PE hatch to the base plate and some PE scratch as loading stops to the muzzles, as well as 0.3mm styrene rods to represent the ignition cables. A styrene strip connecting the top launchers completed the picture. The see-through effect enhanced the overall impression greatly. The kit’s cranes are very simplified. Adding PE and styrene scratch at the center brace helped it a lot, even though I could have done more to make it look like the real thing. Note that the actual crane is the on top of the center brace. Below this brace is a torsion bar. The torsion bar and the crane are not connected. So the setup of the kit is wrong in this case. 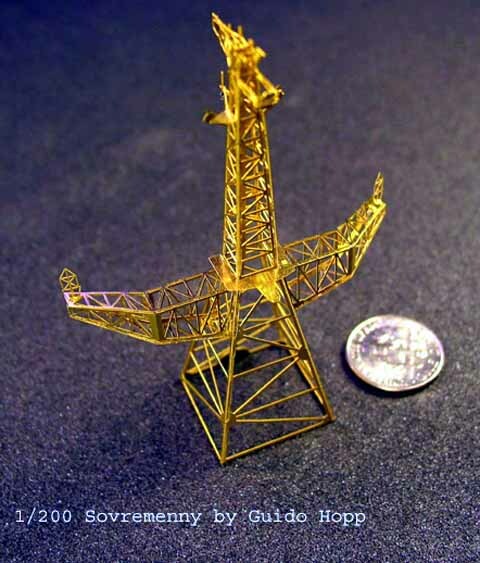 Integral part of Sovremenny’s crane system are maintenance platforms and cable braces on the funnel right beneath the Light Bulb Sensor platform, which I constructed form PE and styrene scratch. Boats and launches are covered by canvas made from aluminum foil, brushed onto the details of the boats with a bristle paintbrush. Folds appearing in the in the foil are naturally enhancing the depth of detail. 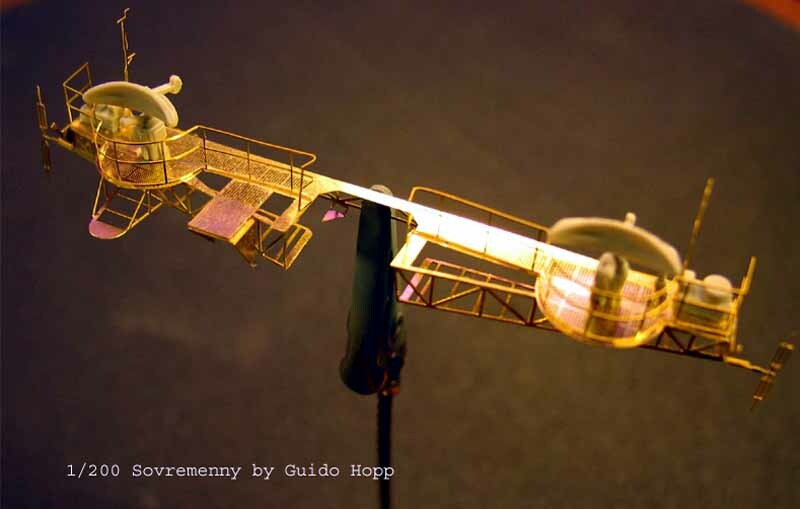 The foil is painted in Tamiya Buff (XF-57 ), darkened with a couple of drops of Flat (XF-52), and Brown (X9). 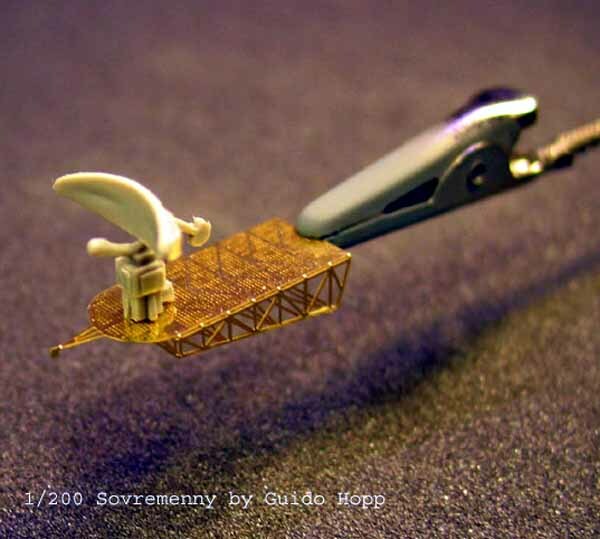 Most likely you will have to touch up unpainted spots after gluing the boats to the deck. You may choose to use any of the above three colors to do this: Using lighter and darker shades in the right spots - lighter shades on horizontal surfaces and darker around the folds- will create the effect of sun bleaching and dirt on the canvass. The life raft canister racks can be used on the boat deck, as supplied by the kit. I went on to build the helicopter. The WEM PE fit beautifully. However, I forgot to put some counter weight into the nose of the chopper, to balance the heavy tail fins. Subsequently it’s nose is always up in the air and I’ll have to glue the chopper to it’s deck. 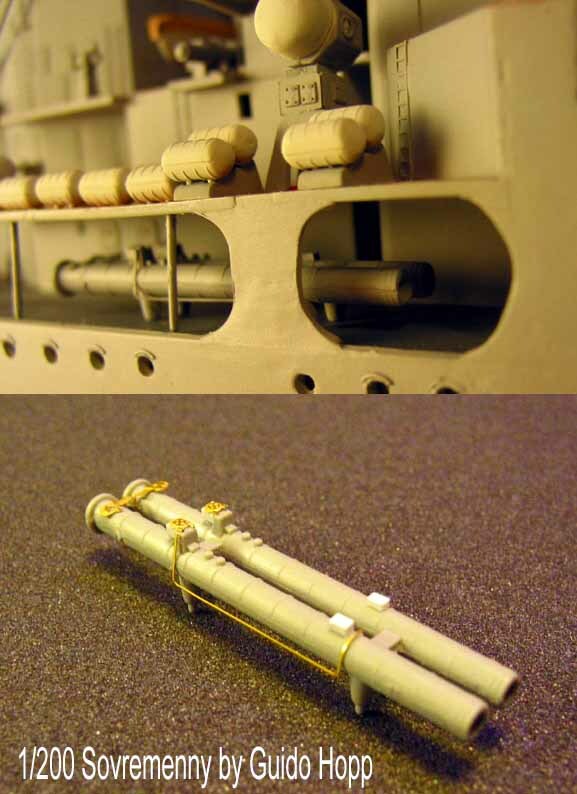 Some 2mm styrene rods were added to represent the exhausts. There are depressions on the chopper’s hull, but no parts for the actual exhausts. Right in front of the landing gear should be square boxes on either side of the chopper’s hull. A little styrene scratch did the job. 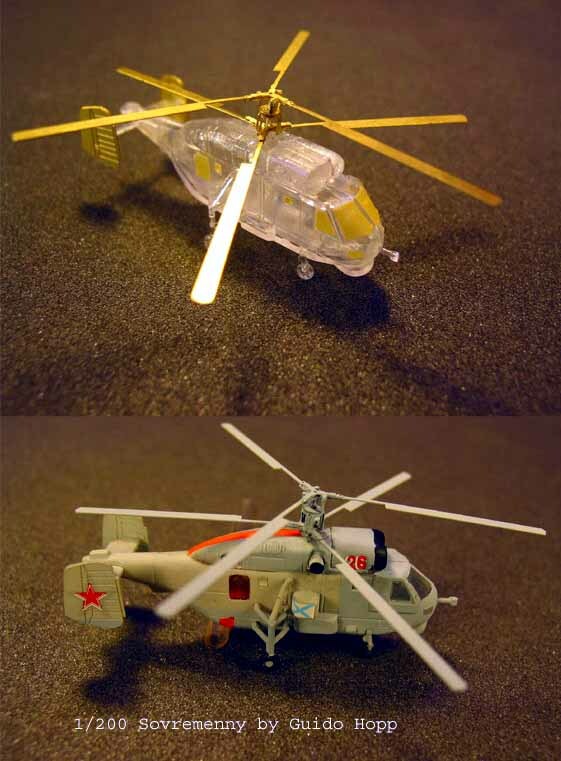 Be extra careful when removing the parts of the chopper: The clear material tends to shatter like glass - especially the landing gear, when mistreated or even just handled without extreme caution. 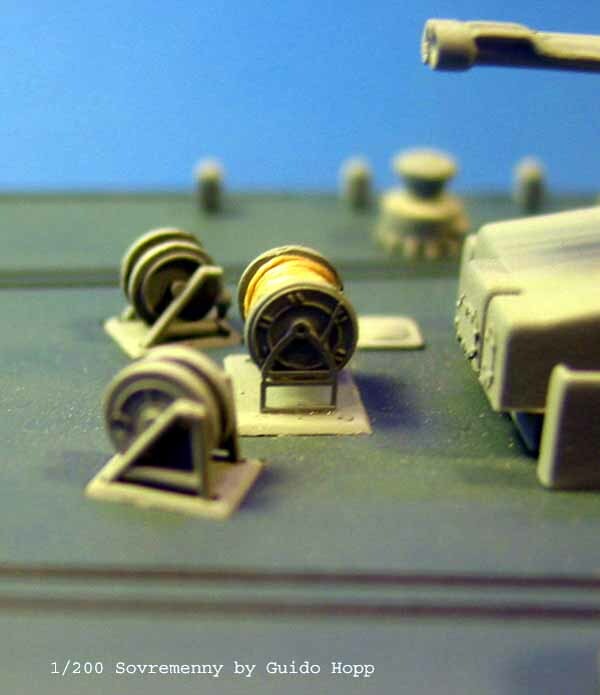 The light grey color used is the same as on all of the sensors and radomes, for the blue shade just add a few drops of Tamiya Light Blue(XF-23) to previously mentioned light grey. Orange marking and black for the air intakes and exhausts finished them. WEM’s resin AK 130 turrets are beautifully made and clearly are much nicer than the igloo-shaped parts provided by the kit. These were the first resin parts I ever used. When I unpacked them I found the barrels slightly wrapped. I dipped them into boiling water for just a few seconds and straighten them out, which worked nicely. After rinsing the turrets in mild soap water, PE applications and color coats were accepted nicely. 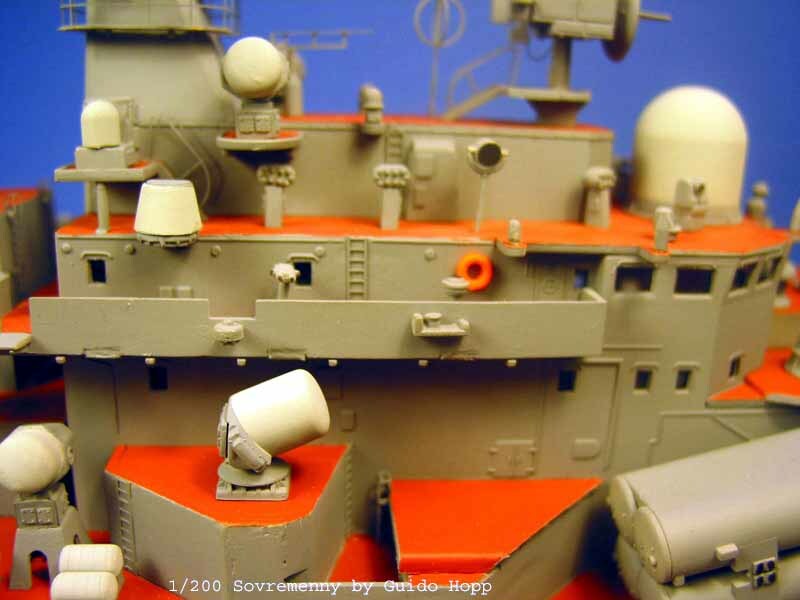 Barrel cooling hoses/pipes – molded onto the resin barrels - are as well provided in the PE set, just in case you don’t buy the turret replacements. 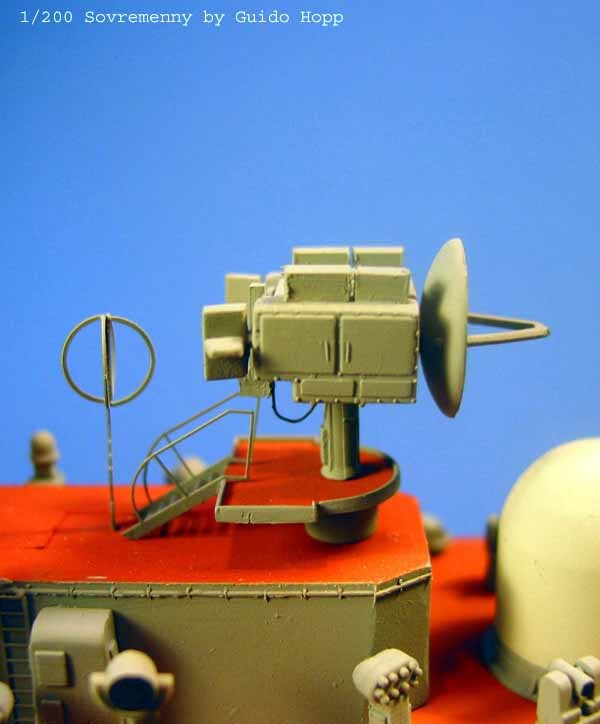 I definitely recommend to use WEM’s turrets, as they greatly enhance the overall impression of the kit. I’d call them essential, even though the setup of the front platform is not 100% proper as there is no space provided for access ladders on neither side. Resin-experienced modelers may be able to re-shape them. I’d rather do not on my first resin trial. 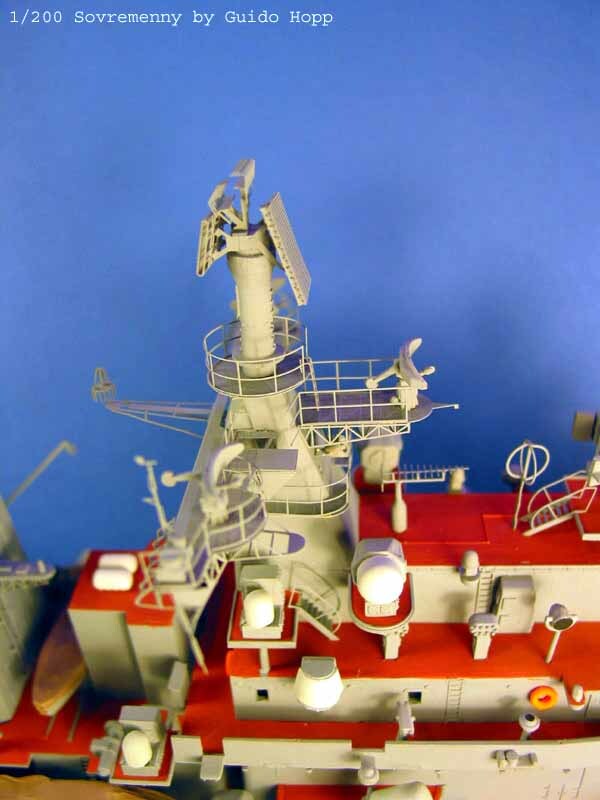 I might add, that the WEM turrets have positioning pins, that allow mobile installation, which would have required installation of the turrets before gluing the deck to the hull. 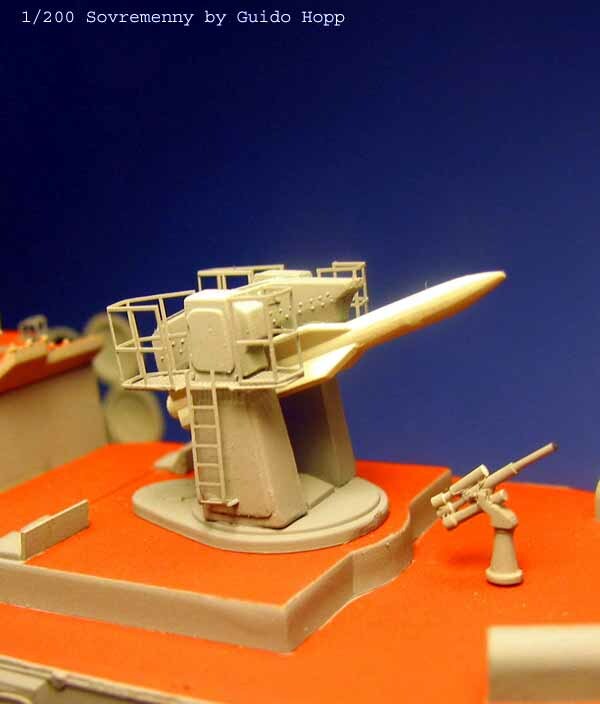 Building SA-N-7 launchers and adding PE platforms and railing was straight forward. On some Sovremennys the platforms are painted deck-orange. 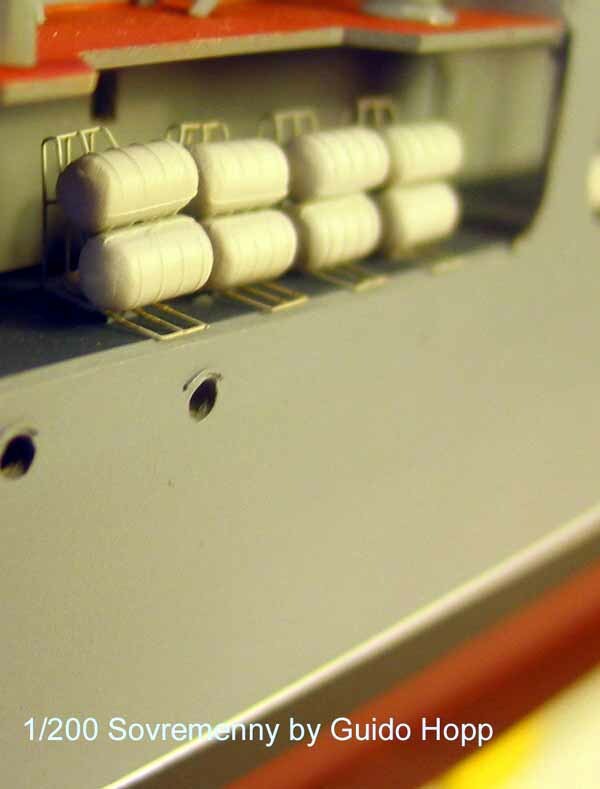 Please note the blast diversions right in front of the hatches on forward SA-N-7 deck made from styrene strip. 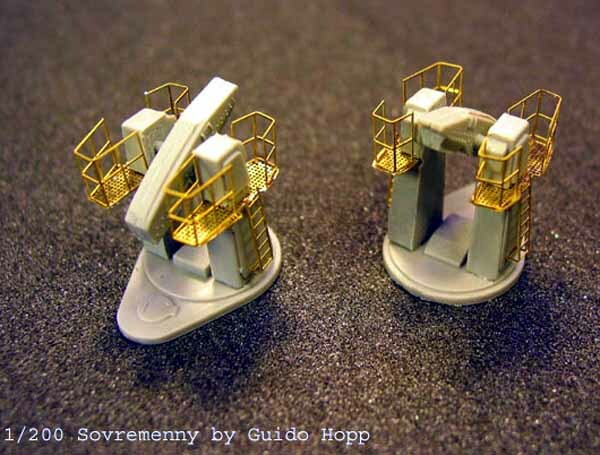 Reference pics of the Sovremenny show the flight deck’s safety barriers at various angles: Sometimes they are vertical, sometimes they are leaning to the outsides of the deck. I chose to make them lean about 45° to the outside, because it gives the flight deck a more spacious appearance (and it looks cooler, IMO). Take care that they do not interfere with the handrails on the neighboring inclined ladders. After this the restraint netting and braces have to be applied. Both are supplied by WEM. I painted the netting the same was as the boats canvasses. The braces are kept grey. I first glued the braces to the netting. Then maneuvered the whole thing into place, fixing it with CA glue only at the inside corners. Beautiful! A feature I wouldn’t want to miss. Finally the tracks for Sovremenny’s unique telescopic hangar were installed. 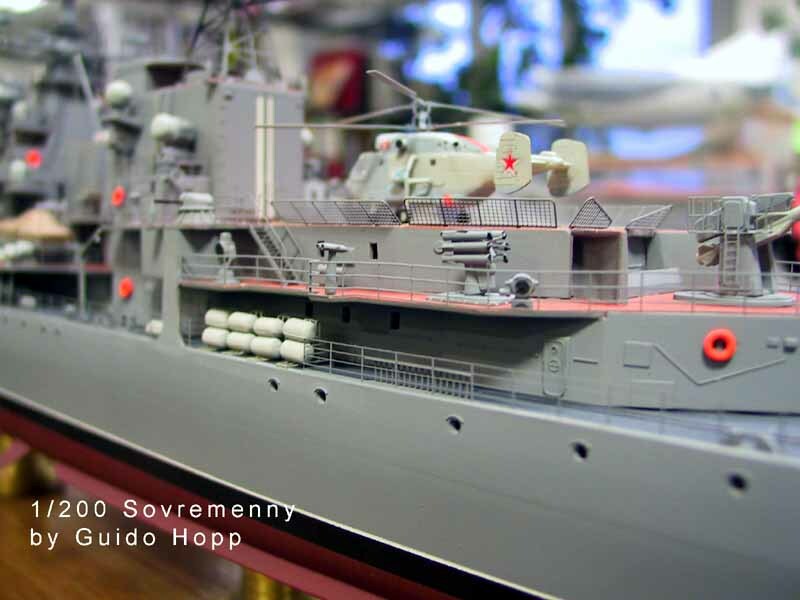 Next came more serious assemblies of masts, platforms and radar systems provided by WEM. I started with the mainmast. The construction, which will be impressively towering on top of the aft superstructure, is made out 18 parts. Already the assembly of the central four parts of the mast proved to be tricky, as I did not heed the very good and detailed instruction. (Definitely my mistake, Peter!) Instead of gluing the sides of the masts to the inside of the front and back parts, I glued them to the outside. Subsequently the platform did not fit into it’s designated space right above the yardarms. A problem I fixed by removing the inside rim of the platform with my Dremel. Yardarm construction was straight forward and easy, while fixing them to the mast wasn’t, as the attaching surface is very small. Now I put the platform into place and added the Bell Shroud Sensors cut from kit part E25. In total I found three possibilities for railing setting on this platform: One bar low railing, two bar high railing and no railing at all. For now I left the railing away. I painted the mast grey and applied highly thinned black color to represent soot from the funnel and placed it onto the hangar roof. With setting up the foremast configuration I came to decide which ship I was finally going to build. 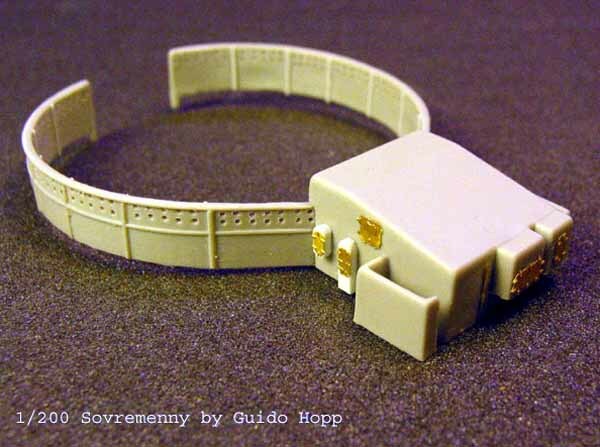 Both type 956E Sovremennys were sold to China. According to my information, only 698 Yekataringburg was close to completion, when being sold. 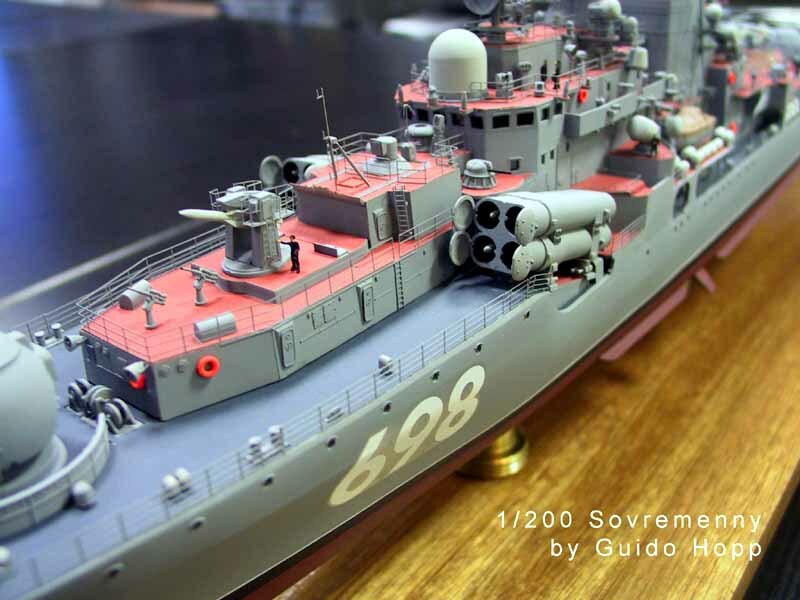 (The other was undesignated project "Alexander Nevsky" was listed as "Hull 19" only and is called 137 Fu Zhou today) Since Chinese vessels are painted in overall bluish off-white, Yekataringburg was my only choice. Subsequently the Top Plate radar configuration had to be applied. 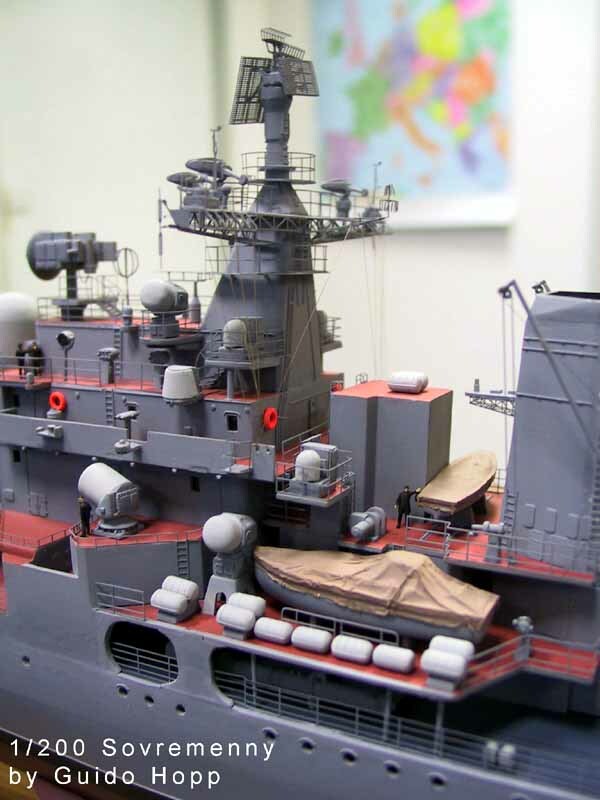 (Fortunate are those, who have 956A kits, as they may choose to install the more impressive Top Steer radar configuration). Hints to which vessel Top Steer or Top Plate radar is applied are given in WEM's instruction sheets. Still, further research is necessary. Combinations of Top Plate (Front) and Top Steer (Rear) called "Plate Steer", do apply to three ships of the Sovremenny Class. Decal pennant number application to the hull wasn't painless and curse-free, but OK. The mounting post for Top Plate radar had to be slightly modified, but with the instruction given by WEM, still easy to do. Building Top Plate radar was straight forward. Before adding further details to the foremast’s yardarms (WEM PE part 32), I highly recommend to test fit the part to the foremast’s “pyramid” base: fitting problems, occurring when the lower walkway was being installed, interfered with the installation again, making filing and sanding on both “pyramid” and yardarms necessary. 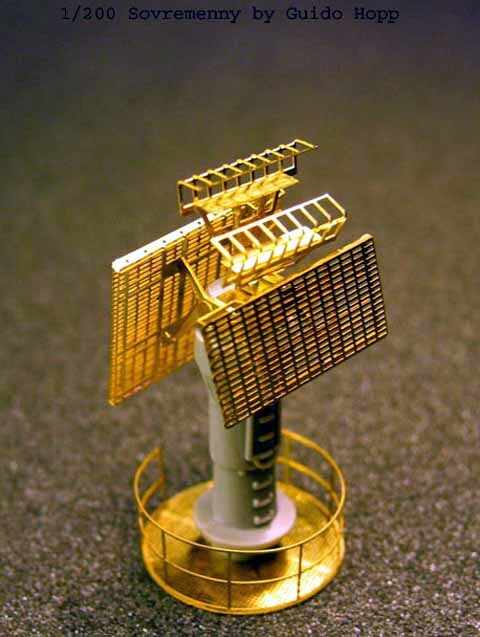 As well, you might want to consider to add PE parts 25 and 9 (antennae and weather vanes) at the finishing moves on your kit, as they are very delicate and bent easily. Next was the forward platform. After painting and having applied the railing to the foremast’s lower walkway, I installed the above mentioned parts into place. This revealed the only weakness of the PE set: There are considerable gaps between the forward platform and the yardarm platform. Finally, I added vertical ladders, where applicable and sub-assembly no. 4. the aft platform. Besides specially designed railings, which are to be placed in certain locations (as described in the instruction) 3 different types of railings are supplied: 2-, 3- and 4-bar railings. 4-bar railings apply to the main deck, 3-bar railings to upper decks and 2-bar railings to platforms and open walkways. One bar low railings applicable to the Light Bulb Sensor platforms on the funnel and the Bass Tilt decks on either side of the lower bridge section are not supplied separately, but can be cut form other railing styles or scratch, which I did. Having pre-shaped most of the upper deck's and walkway's railings, finishing and installing the kit's railing took about 6 hours including painting, only. 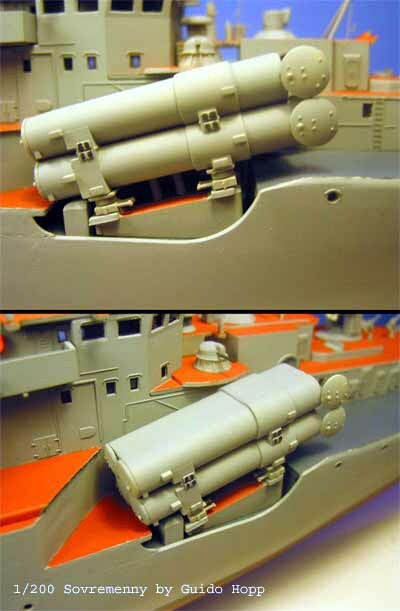 The focsle railing, even though pre shaped in WEM's PE set, was a little tricky to install as it was not fully match the negative curve of the deck right in front of the SS-N-22 launchers. As well, they were a little too short and some segments had to be added. Some finishing touches, such as crane and foremast rigging concluded my built. Still, there are cage aerials and a lot more rigging to be done. Mr. Jim Baumann has provided me with the how-to’s and I have ordered necessary material form WEM. I guess it is going to take quite a while, until I have mastered this art. I promise to share my experience, as soon as I have finished the rigging. I can honestly say, that this kit tested me to the limits of skill and nerve. Several times I was on the brink of discontinuing the built. However, I learned many new techniques and skills and trained my patience quite a bit. Now, looking onto the (almost) final result, I have to admit, that even the tough parts were fun – in their own special way. The PE set and replacements of WEM are not exactly cheap, but magnificently made. I won’t complain, but even on these is room for development still. Replacement boat-cradles and –detail, chaff chutes for the stern, in-scale anchor chains and maybe some details for RBUs and an improved Kite Screetch platform could enhance this already great product. My 698 Yekatringburg is by no means perfect. Still, I am very satisfied and will – most likely – build another ship of this class some other time. 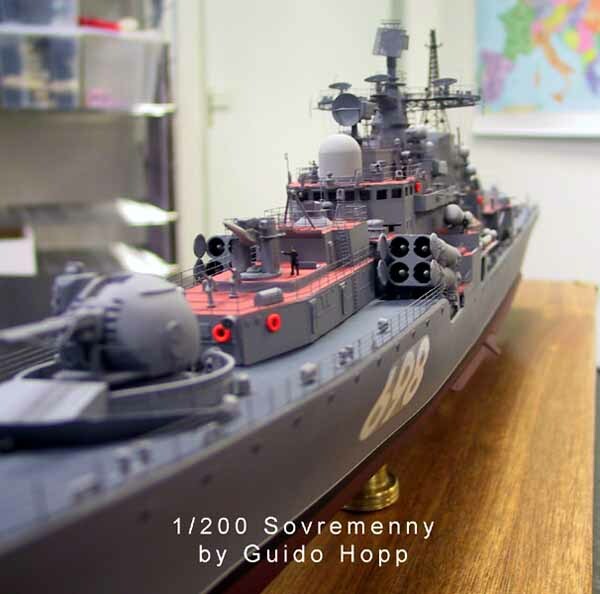 Trumpeter’s 1/200 956E Sovremenny Class Destroyer. Opinions and comments are highly appreciated. I’ll be glad to answer your questions on the message board of this homepage or directly at guido-hopp@hopp-import.de.